Magnetic wooden magnets in cheerful primary colors allow your child to explore and grow while having tons of fun! 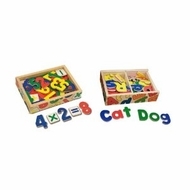 This bundle includes 52 wooden alphabet letters and numbers zero through twenty, plus five math signs. Each set includes a wooden storage box. Product Dimensions: 4.5 pounds. Recommended Age: 24 months and up.